Are you super bummed that you weren’t able to attend Billy’s senate kick-off? Perhaps you needed to clean those dust bunnies from under your bed? Or perhaps you just wanted to do literally anything else rather than watch someone who can’t handle the responsibilities of being a county councilman try to convince us that he’ll make a super state senator? Whatever the reason, never fear! There’s a video of the night’s festivities! And it is awesome. But, not in the way Billy wants it to be! Click the video to watch! And why does Bongino keep coming back here? Hasn’t he gotten the hint yet? The best parts are Billy trying to explain why he’s qualified, Billy thanking the NRA representative for “doing a great job”, and Blaine channeling his inner David Hasselhoff to tell us all why Billy is such a great fella. 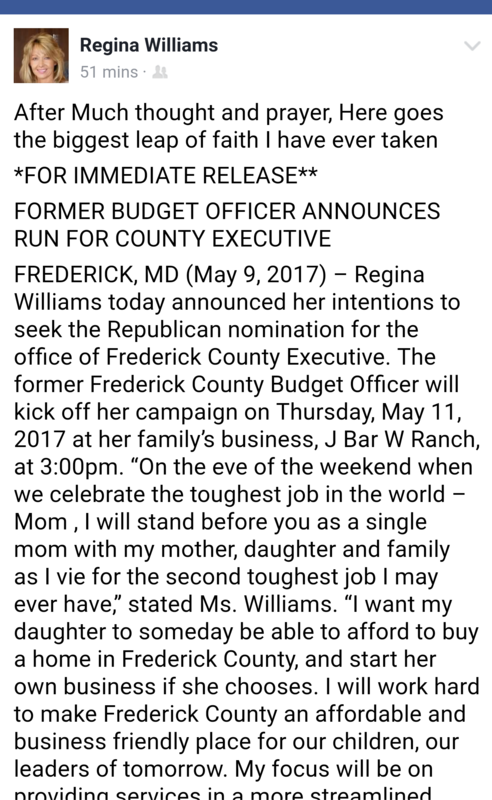 There’s also some Washington County candidates and Frederick County Council candidate Dylan Diggs asking for support. Not sure why these fellas think it’s wise to hitch their wagon to Billy’s fading career. Y’all may want to create some distance soon! Also, what we noticed is who wasn’t there. Not one fellow council member, not even Kirby! Could it be that #kirbydelauter doesn’t want his campaign for CE tainted by Billy’s nonsense? Just asking questions! A trillion shades of NO! Well, he possesses a modicum of self-awareness! Sorry you had to be exposed to that Myrtle! More shades Grumpy Cat! More shades! Not to worry folks! With your assistance,we will make sure that everyone remembers his disastrous four years at the helm of our county. And, if people need to be reminded of his arrest, the way he cussed out the teenage ref, or any of the many other ways he behaved that shows just how undeserving he is of any of our votes, well…we’ll be here to remind. Tagged Blaine Young, Delusional, Never, No, Not fit for public office. World of NO, Shrelauter and clown. We need brains. FFS. There’s a difference between “your balls” and “you’re balls,” you BALLS. 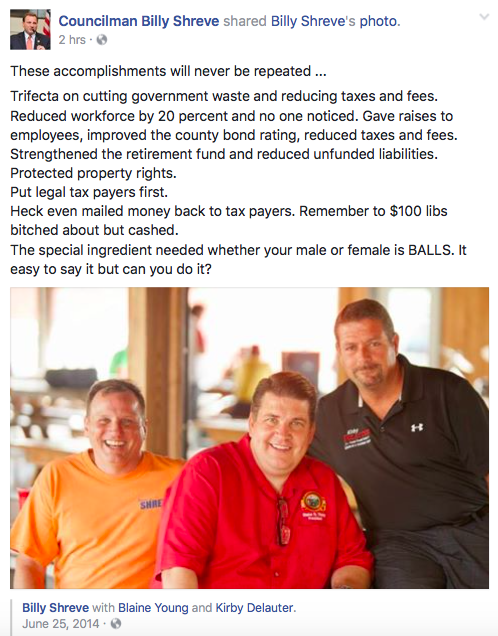 This is your official Councilman Facebook page. Please try and keep up with fourth grade in this space, if you want to make grown man plans. Guess what, jerk-face. We cashed those checks and donated to charities providing for the people you kicked in the BALLS, where a $100 donation will do a lot more than buy one dinner out. Disgusting. Trying to buy a vote with $100. Bless David Gray (R-easonable) for having some class and leaving his name off of that letter. These crass simpletons. You know who noticed the reduced workforce?! The 20% who lost their livelihood, you collection of scrotal tissues. BTW, “legal tax payers” should know that even undocumented workers pay taxes. And then receive little in return. It’s a genius scam. What loathsome testes you all are. You should all go to this page and comment. It’s your 1A Right. Make sure you document with a screen grab in case you need the ACLU to stop him from silencing you on his official minion of the scary scary government that he hates page.